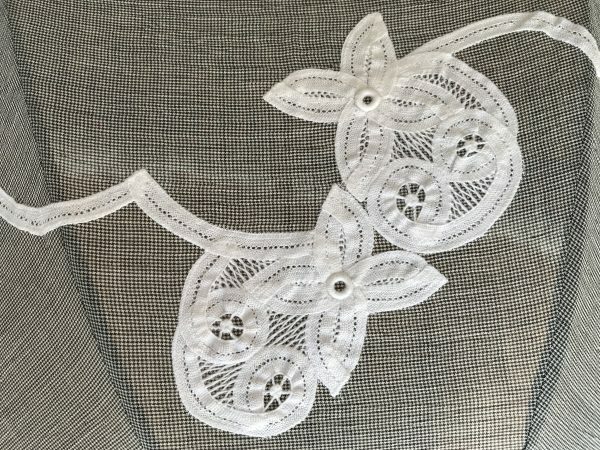 Have you heard of a craft known as “batten lace”? I got a beautiful parasol from my father-in-law last month. 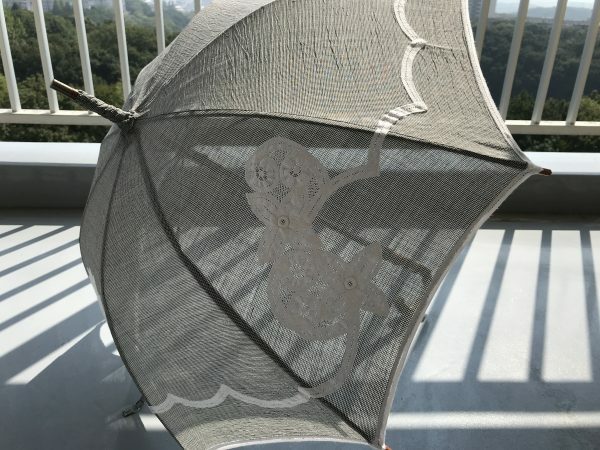 It is a handmade parasol with an elaborated lace design. Batten lace is a lace craft which uses ribbon tapes and stitch them together. In around 1890, its production was started in Joetsu city, Niigata. The batten lace industry flourished in the 1900s and employed many craftswomen. Their products were exported to Europe. However, due to WW1 and other reasons, the industry gradually declined and many factories were closed down. Luckily, the technique of batten lace survived by many craftsmen till today. In Japan, there is only one batten lace shop, “Yoshida battenlace” which can make laces, design and produce various goods. My husband’s home town is Joetsu city, the same city as the batten lace shop. I went to the shop with my mother-in-law in May. That time only a craftswoman was there. I was worried about whether she has a successor for her shop. When we got home, we talked to my father-in-law about the beautiful parasols at the shop. A few months later, he remembered that we talked about it and he bought a parasol for my mother-in-law and myself. I was so surprised, because I didn’t expect it at all. Thank you very much!! You are so kind. This will be my treasure for the rest of my life.